Capt. Chris Dollar brings insight and intel on Chesapeake sporting activity every week in the Bay Bulletin. All eyes are on Hurricane Florence this week as everyone from South Carolina to Maryland feverishly prepares for what weather experts are calling a storm of potentially historic destruction. Prepare properly and be safe, anglers and boaters. Not lost in the hurricane preparations are our remembrances of the people whose lives were stolen by the terrorist attack on 9/11 seventeen years ago. This past Saturday, I tagged along with three military veterans who were taking part in the “Rock on Warriors” fishing event hosted by the Annapolis Fishing Group. We fished with Capt. Justin Downs on the charter boat Migrator, who, along with his mate Jimmy Murray, worked hard to put on fish despite sporty conditions. Approximately 40 military service veterans, family and friends enjoyed a morning of fishing on the Chesapeake followed by a top-shelf BBQ lunch provided by Adams Grille and Tap House in Edgewater. Big thanks to the charter skippers and Anchor Yacht Basin for donating their time, expertise and equipment. Try the West River #1 buoy, Thomas and Podickory points for keeper stripers. Or, troll the channel edges with six-inch Tsunamis on cut-down umbrellas or rigged in tandem; colors chartreuse/silver (aka Mountain Dew) and blueback are particularly effective. Option #3 is to drag Clark or Drone spoons (silver or two-toned) or surgical hoses (Rock Hall Reds, purple or blue) on #1 or #2 planers. There’s no shortage of schoolie rockfish, and the occasional snapper bluefish, busting on baitfish from Breezy Point into Eastern Bay, but the ratio of undersized to keeper rockfish is pretty high. Metal jigs (Rain Minnows, Sting Silvers, and Specialized) all catch fish. Or try topwater in the shallows and drop-offs. Smack-it Jr.’s or MirrOlure under 4-inches is my preference this time of year, but similar plugs can bring strikes. Before Florence interrupted the fishing, things were good in Virginia for Spanish mackerel and flounder, and we saw good bottom fishing for spot, kingfish and croakers. Offshore, the billfish action was off the hook. It’s hard to say if it’ll pick up where it left off after the big blow from Flo. Also in the mix are dolphinfish, tunas and wahoo. 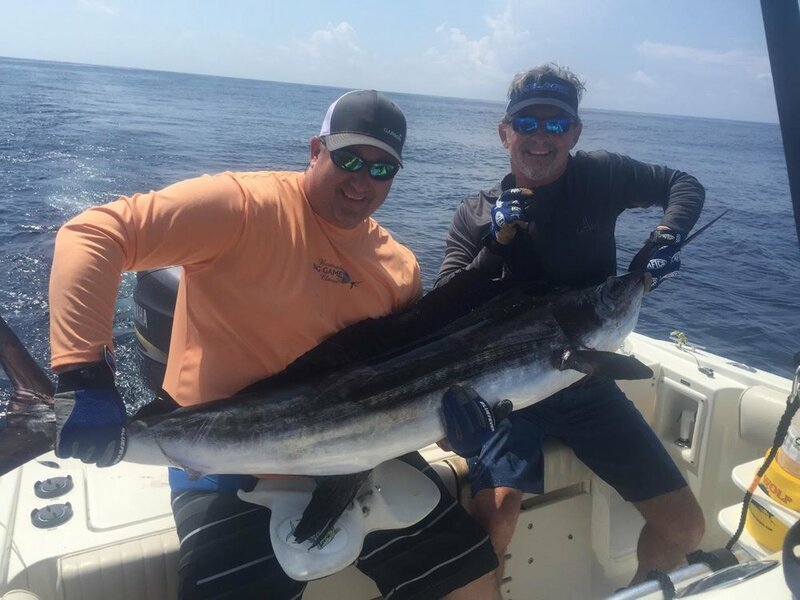 Fishing the Washington Canyon out of Chincoteague, Rob Pellicot, Daryl Thomas and Adam Morris, all members of the Frederick Saltwater Anglers, had a blast catching white marlin and mahis. A bit down the coast in Wachapreague, Dale Dirk’s crew, fishing on his sportfisher, Heatwave, included Jane Millman, Danny Collison, Dave Dirks, Kevin Thomas, and Kevin McMenamin. The gang decked a limit of blueline tiles. Collison recorded a 12.5-pound citation and then bailed mahi, with Millman reeling in the largest at 23.50 pounds. On his own boat, Patrick Coomes' scored a 70-pound cobia fishing off Little Gull near Assateague Island.